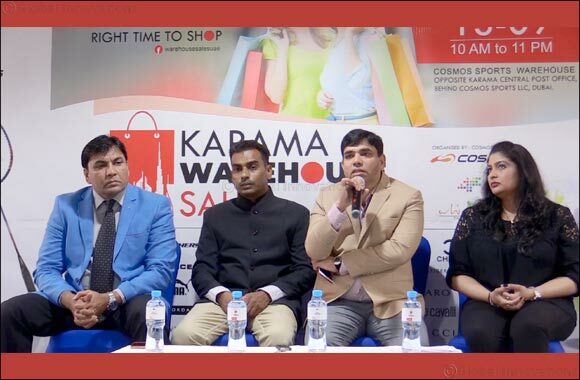 September 11, 2018 - Dubai, UAE: It’s time to bring global brands to consumers at a reasonable price, Organizers informed in a news conference in Dubai that they will be organizing 'Karama Warehouse Sale' in Karama. The fair starting on this coming Thursday (13.9.2017) will last till 9th October . Cosmos sports, one of the prominent multi-brand sports and fitness showrooms in India and prominent advertising company Eden are organizing Karama Warehouse Sale. The sale will be held on the back of the Cosmos Sports Showroom opposite to the general post office in Dubai Karama. The marketing fair is open from 10 am to 11 pm. The official inauguration of Karama Warehouse Sale will be held on Thursday at 11:30 am by Director General of Dubai Emigration Major General Mohamed Ahmad Al Marri and Malabar Gold and diamonds International operations MD Mr. Shamlal Ahmed.